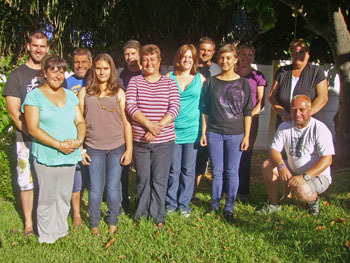 The Tristan da Cunha Education Trust Fund, run by the Tristan da Cunha Association, raises funds to support the education and training of Tristan da Cunha islanders. Rachel Green continues with her studies at the Silvermine Academy in Cape Town, supported by grants from the Tristan da Cunha Education Trust Fund. She hopes to next become the first resident Tristan islander to attend university. This will be expensive, and the Tristan da Cunha Education Trust Fund needs your support to achieve our target of £100,000 so we can apply interest to make grants to Rachel and other students who may follow her in the future. 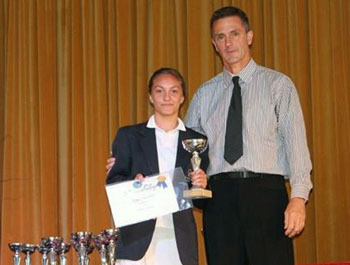 The December 2015 photo shows Rachel receiving an award for oustanding achievement in business and accounting. 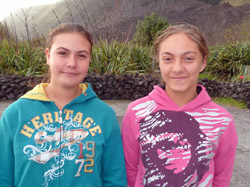 A further £1000 has been sent to Tristan da Cunha by Tristan Association Treasurer Ian Mathieson to support Janine Lavarello and Rachel Green with their second year of studies in Cape Town. Part of the grant will be used for travel to school. This follows a request from Tristan Administrator Alex Mitham. We will soon publish a new page to chronicle Rachel and Janine's time at the Silvermine Academy. Jim Kerr has now returned to England and will co-ordinate Tristan Education News for the website and newsletter. Jim hopes to be in touch with the girls soon to get a first report on their time studying in South Africa. 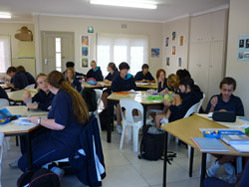 I am delighted to report that it has been agreed that two of our students will travel to Cape Town in December and start at the Silvermine Academy in January 2013. 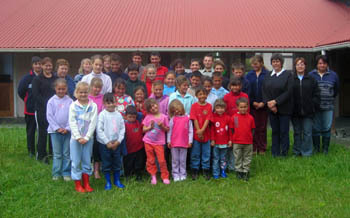 Silvermine is a small private secondary school in Sun Valley, a very pretty area of the Cape peninsula not far from Fish Hoek. 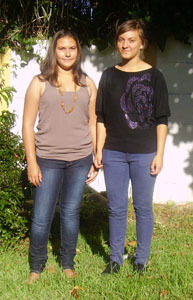 Rachel Green and Janine Lavarello have been selected as suitable candidates for this great opportunity and with their parents have made the brave decision to finish their school education in the Cape and work towards South Africa’s Grade 12 the equivalent of A Levels. 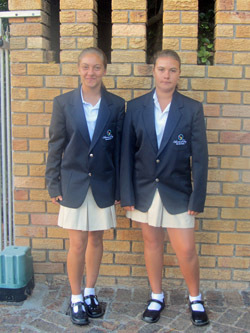 Rachel and Janine will both be 14 years old when they begin school in Cape Town and although they are excited by the prospect they are understandably nervous about such an enormous change in their lives. The girls will have a good network of support as, coincidently, there are a number of Tristan ‘friends’ that live in that area and who have already volunteered to take them out at weekends and support them on school activities. As stated in my last Education News the cost of sending the girls to Silvermine will be in the region of £8,000 to £10,000 each per year. The Tristan Government, with some financial support from Ovenstone, will be able to meet the costs of school fees and accommodation and the parents will be asked to contribute pocket money and leisure expenses. There will be other costs such as uniform, books and school visits and we hope that the Tristan Association will be able to help through the Education Trust Fund. We expect that Rachel and Janine will be the first of many Tristan students to benefit from outside world education in future years and I am sure that the Association’s Education Trust Fund will play an important role. Our aim is to raise £100,000 so that interest can be applied in perpetuity towards helping Tristan young people with their education and training overseas. See our linked: Education Trust Fund Raising and Order Form Pages for details. 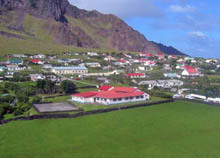 Education on Tristan da Cunha is provided by St Mary’s School which caters for all children from 3-16 years of age. All staff are islanders and a broad curriculum is followed leading to the taking of a limited number of UK GCSE examinations. Pupils presently leave school to enter a Youth Training Scheme in various departments before taking up their first post on the island. In the current financial climate it is impossible for the Tristan Government to fund adequate additional further education and training overseas and so opportunities for young people now are more limited than that for previous generations. As the speed of change, especially in technology, increases, the need for high level skills becomes essential. Heads of department posts (except for the administrator, doctor and factory manager) are occupied by islanders, and it is important that future leaders are well educated and trained if Tristan’s economy is to provide essential income and use scarce resources wisely. which is also a facility to join the Association and purchase other products at the same time.